Ramada Encore York offers the perfect combination of great accommodation, value for money & the ideal location. Ideally situated within the city walls, York's attractions are minutes away ensuring you make the most of your time here. Ramada Encore York occupies a central location in the heart of this charming and fascinating city. Just minutes from the River Ouse and within the historic city walls, the hotel is a family-friendly, contemporary hotel. Ramada Encore hotel in York was the 1st of its kind in the world and is characterised by bright colours, wood floors, a warm welcome and excellent value for money. This contemporary York hotel succeeds where many fail, by combining value pricing with good service and comfortable, modern hotel rooms. Our hotel was designed to meet the needs of today’s traveller whether on business or leisure. The hotel coffee bar is where you can enjoy breakfast to go when in a hurry, or relax with a full range of hot drinks made by the barista or refreshing cool drinks to compliment a wide range of excellent sandwiches and snacks. Residents also benefit from a fully licensed bar which is fitted with a wide screen TV showing Sky Sports. 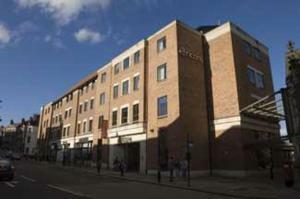 If you are looking for a well priced, central, modern hotel in York, choose the Ramada Encore York.